When writing articles for Breeze magazine I have been inspired by foodie people and places in Pembrokeshire. I recently attended an event which brought together teachers, college staff, farmers and food producers, all wanted to ensure children and young people know about their food and where it comes from. Examples of schools visiting farms, and farmers going in to talk to pupils were good to hear – especially after one local teacher told us a pupil in her class thought tomatoes grew underground and another thought milk was made in factories. These stories surprised me, I naively assumed that children growing up rurally would have a better grasp of how food gets to their plates. Whilst there is some great work taking place to inform and educate about food production, barriers remain – such as funding or health and safety. More worryingly, some farmers and food producers expressed frustration and sorrow at the misunderstanding and hostility they can encounter when off their farms. Talking with them it became clear that it is not only children and young people who know little about these industries that we all rely on. I’m reminded of an adage told by a farmer friend, ‘All being well you’ll need a doctor and a solicitor a handful of times in your life, but you’ll need a farmer three times a day’. I suggest we could all learn more about where our food comes from and value the people who produce it for us. Encouraging more young people into the food and farming industries would be great too, across Wales they employ 1.5 million people, offering varied and interesting careers. I started working in catering 20 years ago and I still love it. 1 – First cook the fruit (or use leftover cooked fruit). Wash the fruit, peel if necessary then cut into even chunks. 2 – Place fruit into a pan and sprinkle over the tablespoon sugar and butter, cover with a lid and gently simmer until soft. Leave to cool, strain off excess liquid, taste and add more sugar if needed, to your taste. 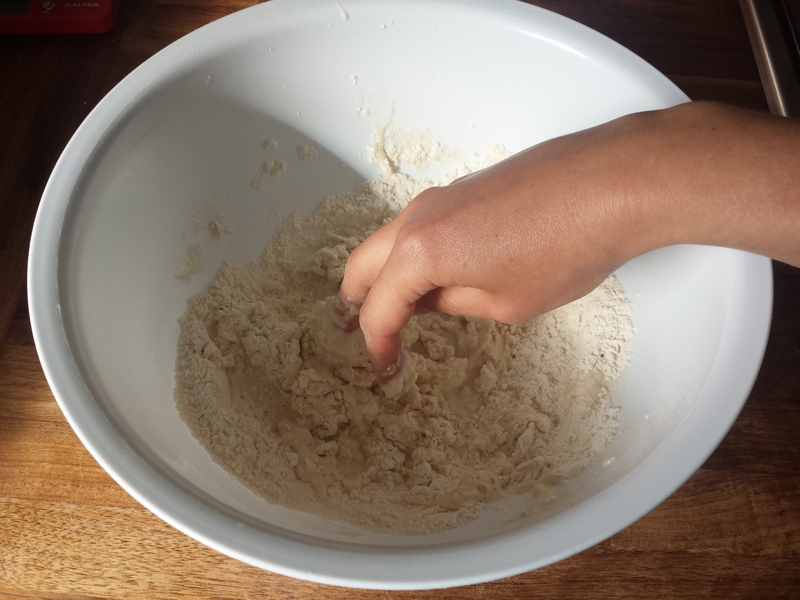 2 – To make the pastry, put the flour into a large mixing bowl, dice the butter and mix into the flour. Rub the butter with the flour between your thumb and fingers, until it resembles sand and there are no more large lumps of butter. Pour in the water, mix and press together into a ball. Wrap the ball of pastry and place in the fridge for 20-30 minutes to rest (pastry will last about a week in the fridge, if you want to prepare it in advance). 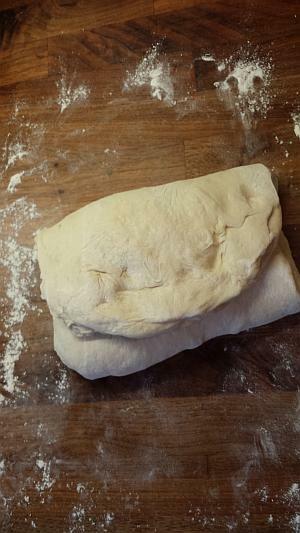 3 – When ready to make, split the pastry into two large and two smaller pieces. Roll them all out to about the thickness of a £1 coin, the large/small should be equal sized pairs. 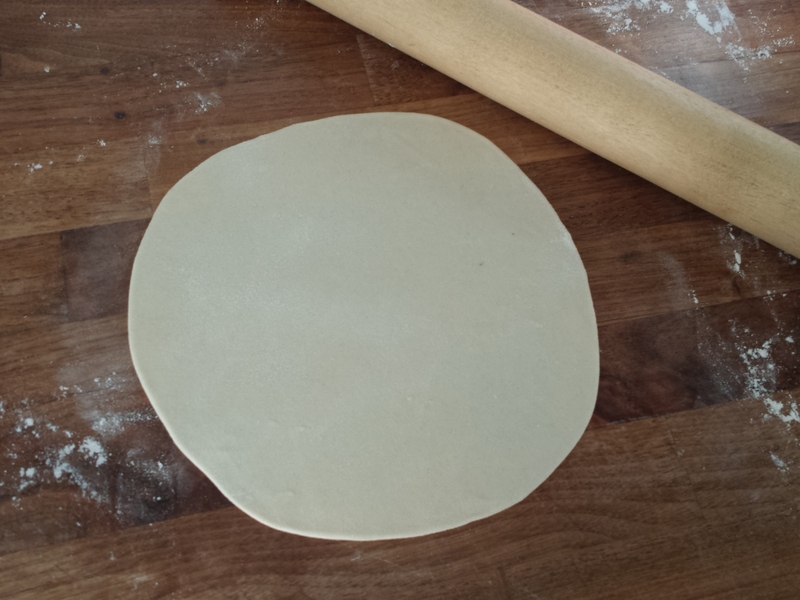 If you like to be neat cut them into rounds, using a saucer/pastry cutter for large/small. 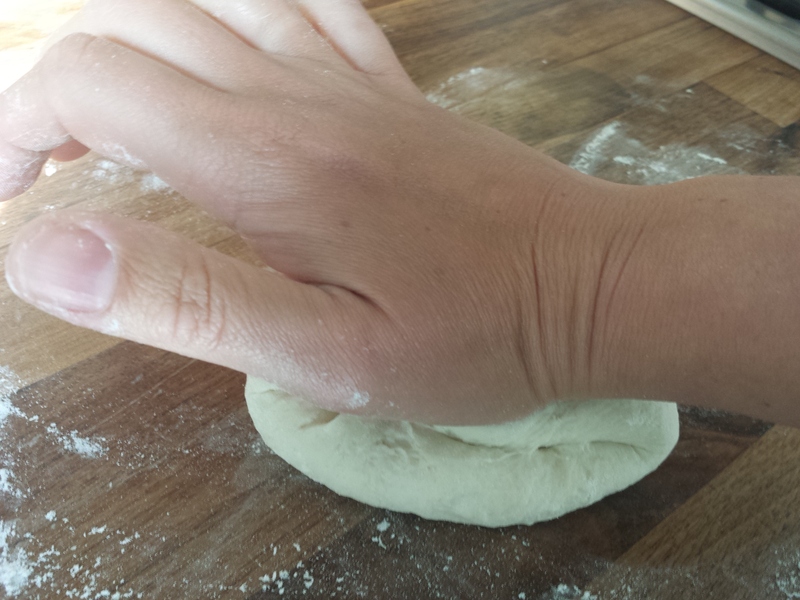 4 – Prepare the small pie (Tarten Planc) first – this will be your tester! Place a spoonful of fruit mix onto the bottom pastry circle, spread it out leaving a 1cm edge. 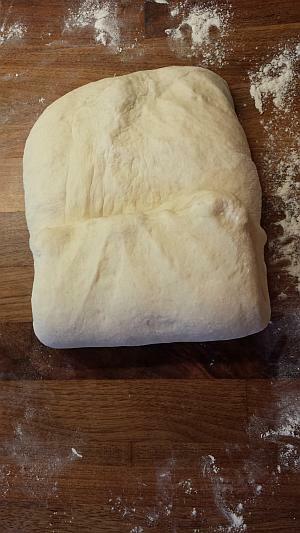 Dab a little water around the edge then place the second piece of pastry on top and seal around the edge, gently squeeze out any air trapped inside before you finish sealing. 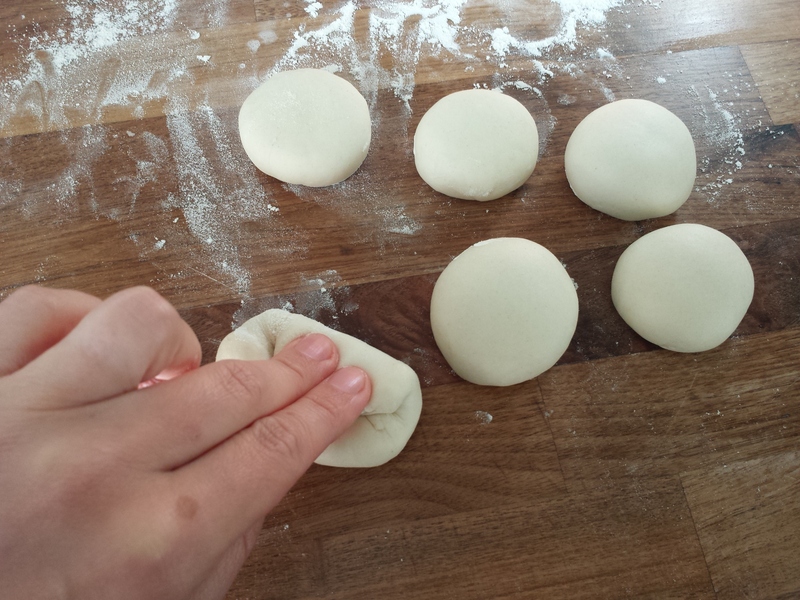 6 – Repeat this process with the larger pastry rounds to make a Harvest Cake. 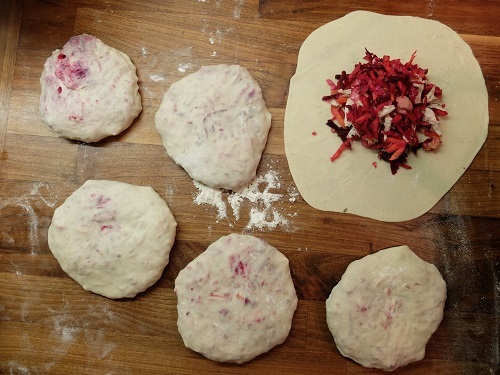 You can use any pastry scraps and leftover filling to make Teisennau ar y Maen – roll into a round, add filling to half the pastry round then fold the pastry as if making a pasty. This article was the final part of a series in Narberth Breeze magazine. 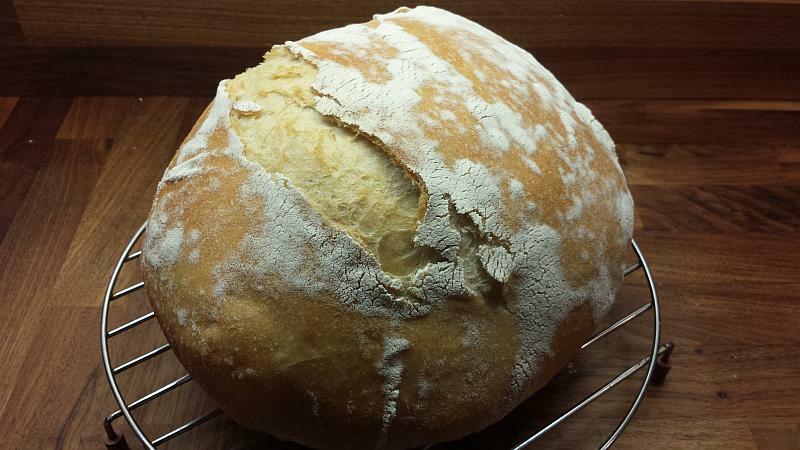 This entry was posted in baking, cookery, Foodie, home made, Pembrokeshire, recipes, vegetarian. In my pile of must read books, which I optimistically keep adding to, are a few titles which might be categorised as ‘ethical eating’. There are intersecting issues to consider and finding a diet that addresses multiple ethical concerns can be a balancing act. Take local food as an example. It reduces the environmental impact of transporting food however local unseasonal or exotic foods may have high energy needs. Supporting local farmers, food producers and retailers maintains employment in our area and keeps money in the local economy. Whilst farmers and food producers from further away need a market for their food and supporting FairTrade and similar schemes benefits people and communities around the world. If these sort of dilemmas interest you I recommend my current read, Sustainable Diets by Pamela Mason and Tim Lang. Pamela Mason is one of the founders of the Food Manifesto for Wales, along with Jane Powell (www.foodmanifesto.wales @maniffestobwyd on Facebook and Twitter). They started a conversation which is growing to become a Welsh food network. Everyone with an interest in food is welcome to join. At this time of policy change, with our political departure from Europe imminent, a hub for discussions and debates around food policy and the future of food, farming and how we feed ourselves in Wales is welcome. These recipes were inspired by a handful of local businesses with a few exotic ingredients to balance it! The free-range chicken I bought was reared by Martin and Danielle in North Pembrokeshire and Andrew Rees’ butcher prepared it for me; into breasts, legs and carcass (a great reason to use local butchers shops, particularly as I’m vegetarian but cook meat dishes for my family of omnivores). Most of the vegetables I bought were grown organically at Ritec Valley in South Pembrokeshire with additional organic ingredients from the Spar and Plum Vanilla Deli, in Narberth and more exotic ingredients from the Spice Box in Haverfordwest. Place the chicken carcass and giblets into a high sided pan, break into pieces to fit in the pan if necessary. Wash and chop the vegetables into large chunks and add to the pan along with the peppercorns and herbs. Pour over cold water to cover all the ingredients. Place on a high heat until the water boils then reduce heat so it simmers. Simmer for an hour. Skim off any froth that appears from time to time. Drain off the stock and you will have a rich chicken stock which you can use for gravy, adding to dishes like soup, risotto and making sauce for a chicken pie. The stock keeps on the fridge for 2-3 days or can be frozen. You can repeat the process, add fresh water to the pan and simmer again for an hour. The stock will have a milder flavour and still be good for the recipes suggested above. When you have finished making stock you can pick over the carcass for bits of meat. This meat and the vegetables can be used for the soup recipe below. Chicken noodle soup with burdock noodles, left. Vegetable noodle soup with rice vermicelli, right. Prepare your fresh vegetables, peel if necessary and slice into long thin strips. Finely chop/grate the garlic, ginger and chilli (if using fresh). In a wide pan heat the oil on a medium heat and fry the onions followed by other vegetables. Cook gently so they don’t brown, until they’re slightly softened. Add the garlic, ginger and chilli and stir in. Slice the vegetables from the stock and chop the cooked chicken into bitesize pieces, add them to the soup pan and stir in. Add the stock and top up with water so all the ingredients are covered. Bring to the boil them add the noodles, cook for as long as indicated on the noodle packet. Vegetable Noodle Soup – use vegetable stock and add cashew nuts/tofu/egg instead of chicken. This article first appeared in Narberth Breeze magazine and Saundersfoot Breeze magazine. 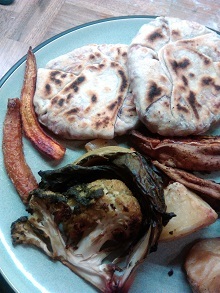 This entry was posted in cookery, home made, Narberth, Pembrokeshire, recipes, sustainable, Uncategorized, vegetarian. Here we are, ready to celebrate the end of another year with a host of festivities including the shortest day and a welcome return to longer daylight hours. Celebrating and feasting with friends and family will get us through the dark months! Flavour-wise, warming spices like cinnamon and cloves, fresh oranges and cranberries and rich Stilton and port are a blast of winters past. Smells that warm us, from the first spiced whiff of a mince pie to the rich aromas of a traditional roast dinner. Whilst bright, colourful foods are in the spirit of celebration – this month’s recipe brings greens and reds to light up your table. I love a roast dinner (except the meat) with all the trimmings. Everybody has their own ‘must-have’ dishes, roast potatoes are surely in everybody’s top three, right?! I suggest this recipe for whole roasted cauliflower as a great replacement for meat when serving a roast dinner to vegetarians and an excellent addition for omnivores too. If cooking for vegan/dairy free diners replace dairy ingredients with the alternatives suggested. The flavour of roast cauliflower is more complex, richer and caramelised then plain old boiled cauli (and doesn’t leave the kitchen with that distinctive sulphur-y aroma.) Alternatively, to speed up cooking time (and save energy) you can cut the cauliflower into florets, coat in oil and roast, leaves and all, on a baking tray for 20-30 minutes. Same great flavour but not such a wow-factor when serving. If you can find a Romanesco cauliflower this really is a dish to show off its fabulous conical spirals. Serve with gravy or one of the sauce recipes and colourful garnish suggested here, alongside all your favourite trimmings for a roast. Remove really tough outer leaves from the cauliflower then cut the base from the cauli so it stands flat, wash the cauliflower. Take off the hob, smear butter/olive oil over the top and rub in all over, use as much as you need to coat the florets. Cover with lid/foil and roast in the oven. Check after 20 minutes and baste, test with a sharp knife, if it’s softening remove the lid so that it browns. Brown for 10-20 minutes. However, if still firm leave lid on, checking and basting every 10-20 minutes. Depending on size it can take 30minutes-1 hour. It’s cooked when it’s soft (or al dente if you prefer) and browned outside, with the leaves crispy. Mash the cheese with a fork then stir in yogurt/creme fraiche to taste, you want a spoonable consistency and creamy flavour with a spike of blue cheese. Mash the nut butter with a fork then stir in soya yogurt, you want a spoonable consistency and creamy, nutty flavour. Serve with a sprinkling of pomegranate seeds/dried cranberries and roughly chopped pistachios/roasted cashews to add brightness and crunch. This article first appeared in Narberth Breeze magazine. 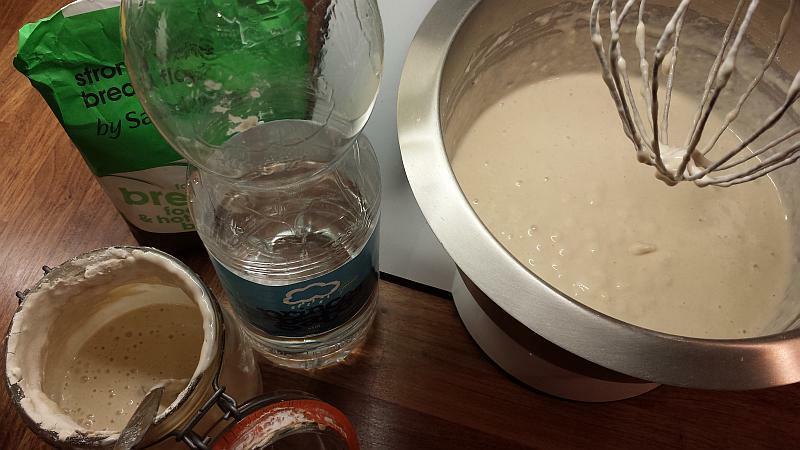 This entry was posted in cookery, Foodie, gluten free, home made, Narberth, Pembrokeshire, recipes, roast, Uncategorized, vegan, vegetarian. 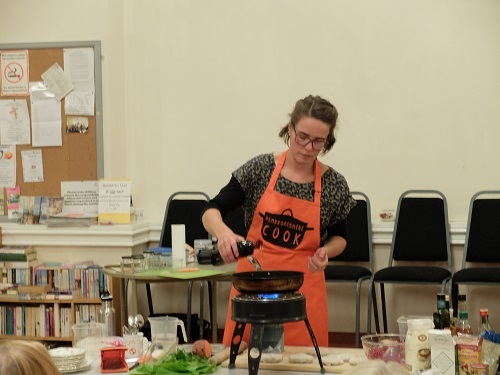 Last week I had a great evening with an interesting group of women in Haverfordwest while giving a cookery demo and talk to ‘The Ladies Who Can’t Lunch’. I was asked to demonstrate a couple of recipes which are quick to produce and tasty (and facilities were limited so it also had to be something I could make on a camping stove!). 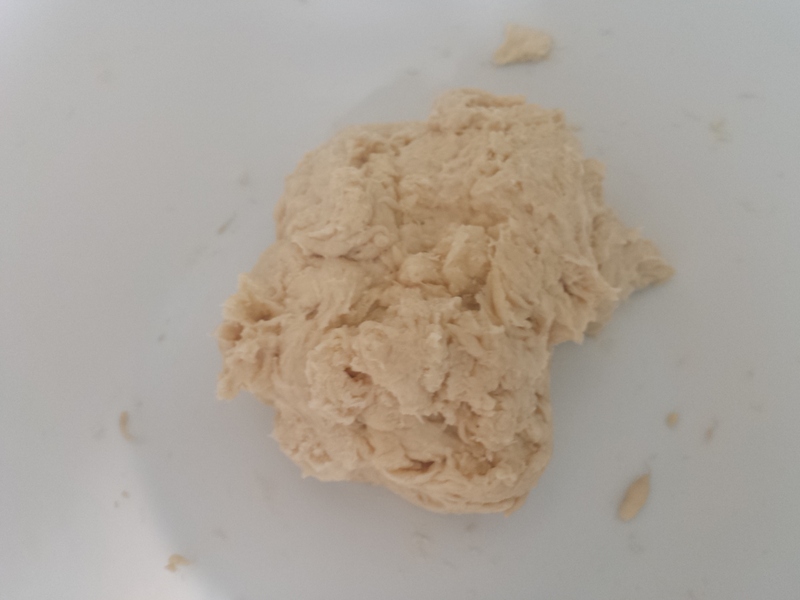 I started by making a tortilla wrap dough, this is so simple, just flour, water and a pinch of salt, it’s barely a recipe really. 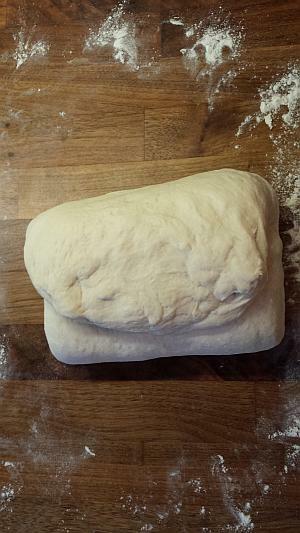 I use 25g/heaped tablespoon plain flour per wrap, a pinch of salt and about half the amount of water to flour (approx 12g/a level tablespoon per wrap), just enough to bring it together into a pliable dough – too firm and it’s tough to roll out, too wet and it’s too sticky to roll out – add water/flour as necessary to get a workable consistency. 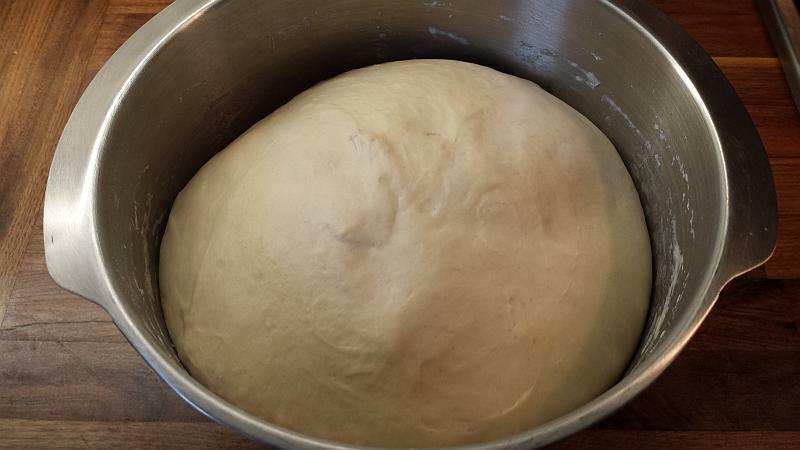 I mix it together by hand, knead it a little until it’s a smooth ball of dough, then I leave this dough on one side while I prepare the filling. Leftovers work well in the filling if you have them or anything in your fridge/cupboard that you think will taste good together. For example I often use leftover veg and meat from a roast; chilli con carne; bolognese sauce; or fresh vegetables and cheese if there are no leftovers around (if adding meat I’d cook it first). I imagine a sweet filling would also work well but I’ve not tried it (yet), maybe apples and blackberries… Chop/dice/grate your filling so it’s all in small pieces – so they’ll heat through quickly. 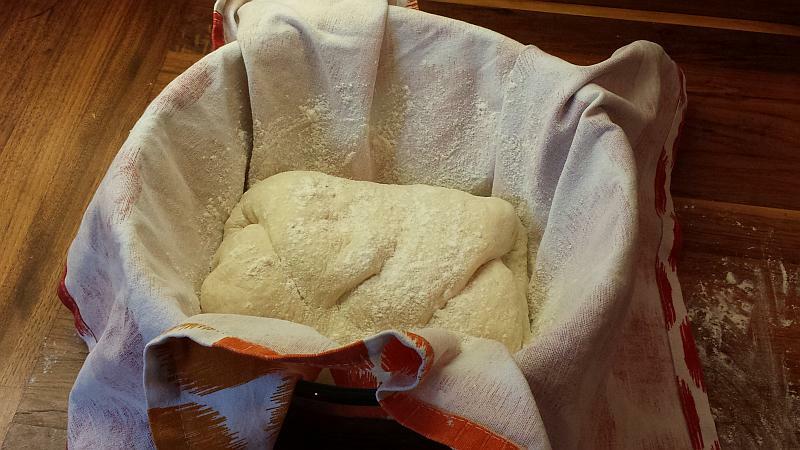 Divide your dough into equal portions, depending on how much flour you used and how many you plan to make. 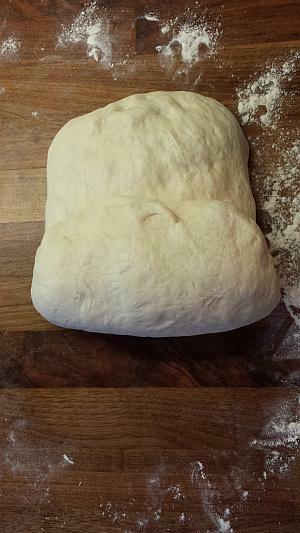 Knead each small portion into a smooth ball, squash flat and roll out into a disc about half a millimetre thick and 20cm diameter. If you’d like to make tortillas/flat bread; these are now ready to pan fry, in a lightly greased frying pan on a medium-high heat. Alternatively you can fill the centre and fold the edges over the filling to make a parcel. Pan fry these in a little oil on a medium high heat. 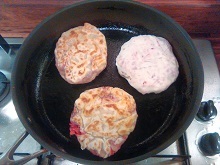 I fry on the folded side first and when it has changed colour and started browning I flip over to cook the other side. Adjust heat as necessary, they need to brown but not too quickly as the filling needs to warm up too. They parcel is cooked when it’s turned opaque white all over with golden brown patches. You can keep them warm in the oven, serve straight away or cool and have them cold for packed lunches. 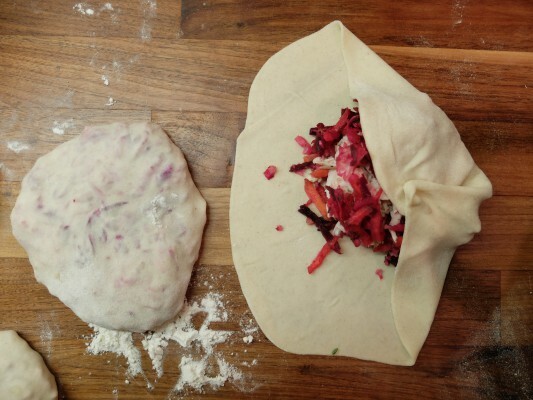 This entry was posted in baking, bread, cookery, cookery workshop, home made, Leftovers, recipes, Uncategorized and tagged family food, leftovers, quick, simple suppers, tortilla wraps, waste not want not. Ready Steady Cook lunch at Ysgol Glannau Gwaun. Springboard cookery workshop with Transition Cafe. I’ve really enjoyed working with families taking part in the Springboard cookery workshops at Pembroke Dock Community School, Golden Grove School, St Mark’s School and Ysgol Glannau Gwaun. Today was the final workshop for this term and we enjoyed meeting Elenor from Transition cafe and cooking up some great dishes, ‘Ready, Steady, Cook’ style! 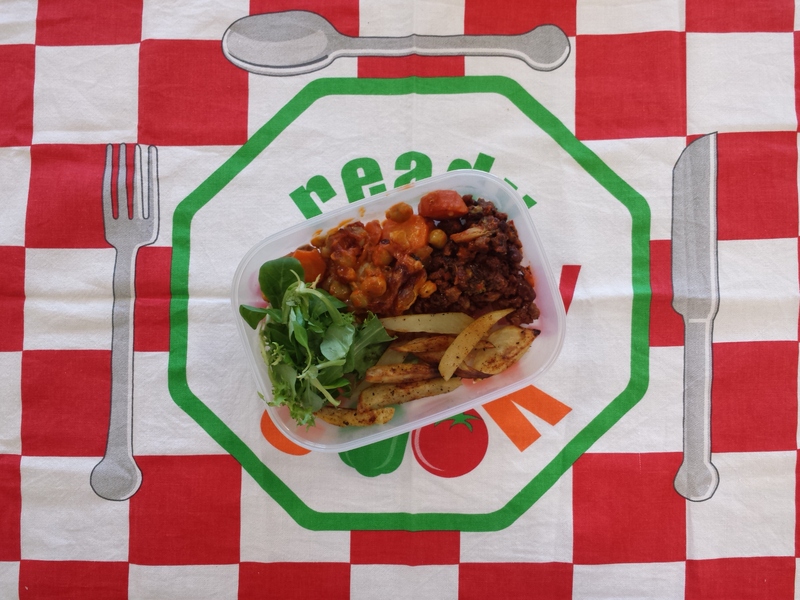 In the photo is a lunch box with chilli con carne, fries, bean casserole and salad, all made from leftovers and food that would otherwise have been wasted, a great effort by everyone involved. I’m still trying to work out if/how to attach the recipes from the workshops to Facebook and/or this blog. It can’t be that hard, can it??!! Will update when they’re online. Have a great summer to all who took part, and hope to see you soon. 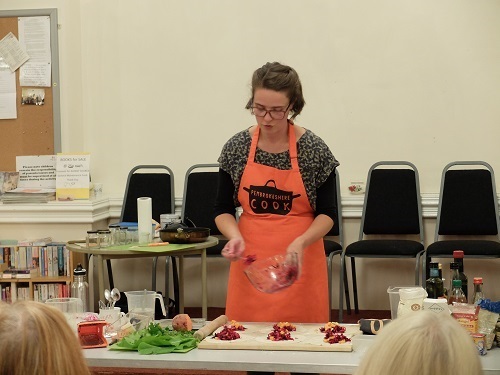 This entry was posted in children, cookery, cookery workshops, families, family, pembrokshire, ready steady cook, springboard, too good to waste, transition cafe, workshops. Pembrokeshire Cook are running a gluten free baking workshop at Canolfan Hermon on Sunday 17th May, 3pm-6pm, £15 per person. Please contact Canolfan Hermon or phone them on 01239 831968 to book onto the workshop. For more information about the workshop please contact Pembrokeshire Cook . This entry was posted in baking, cookery, gluten free, workshop. 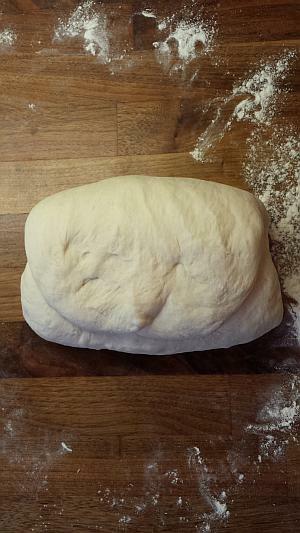 The Real Bread Campaign are working tirelessly to promote good, honest, tasty bread in the UK. I’m proud to be a member and planned to support their Sourdough September promotion. I am a little late..! 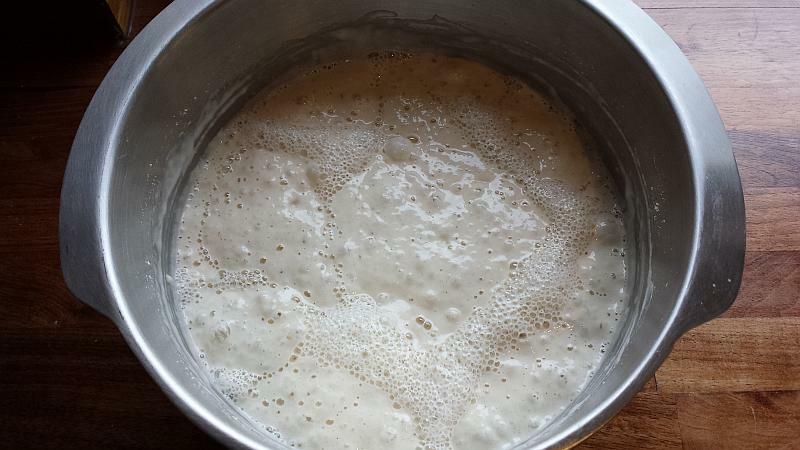 I hope this addition to the plethora of sourdough bread recipes available will prove useful, I have illustrated it with lots of photos as I think this helps if you’re trying it for the first time. Over the past few years I have honed my recipe based on my life at the time. The long fermentation and proving process is adaptable and I’ve been able to fit it around a busy working day, lazy weekends and now the demands of a small child. 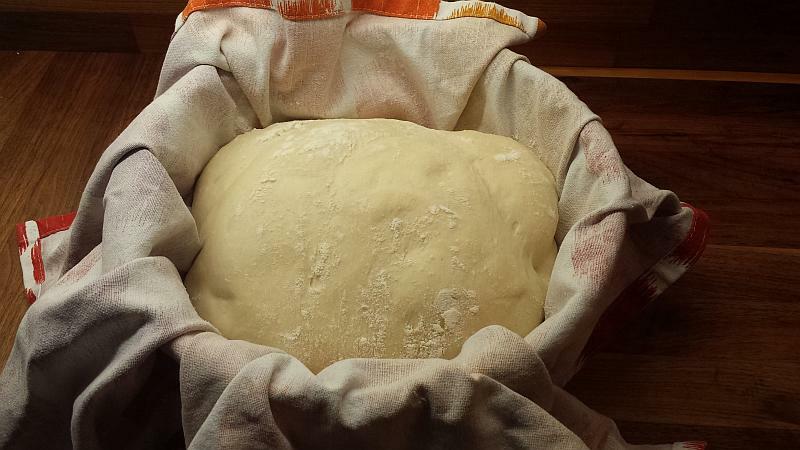 The process relies on time but demands very little from the baker, probably an hour of your time over 24 hours. 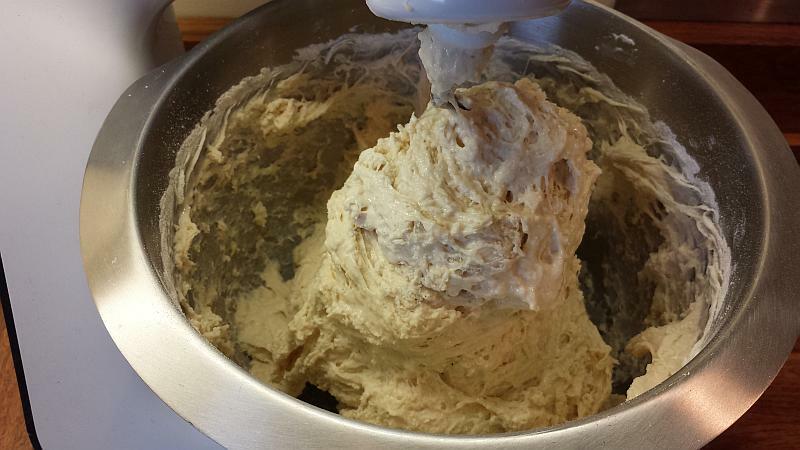 I now use a food mixer but it’s not much more work to mix and knead by hand. 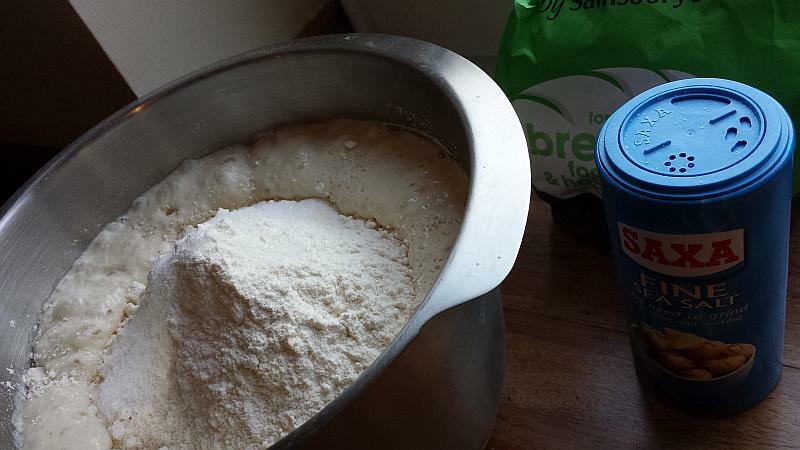 Create the sponge; put 250g flour into a large mixing bowl/food mixer bowl, add starter and 300g water. Mix/whisk until smooth. Cover and leave overnight, it should be sticky and bubbly in the morning. 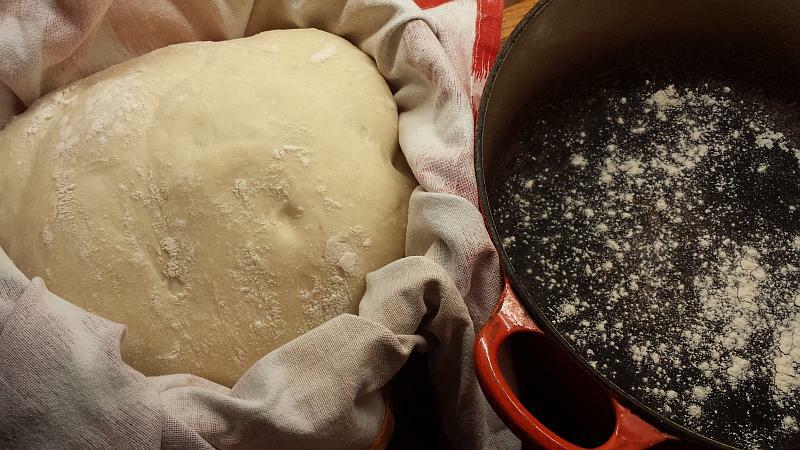 (Refresh starter by replacing 115g bread flour and 115g water). 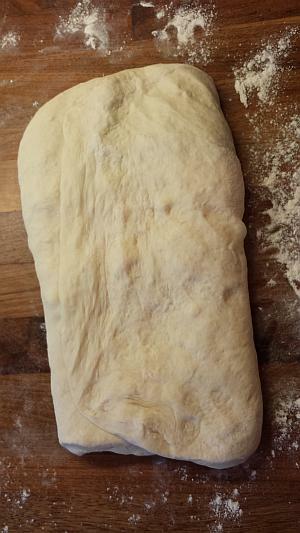 To make the dough add 300g flour and the salt to the mix. 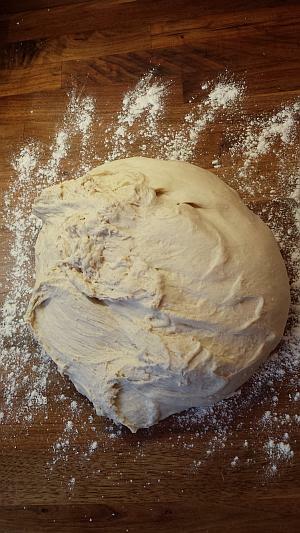 If kneading by hand, it will be sticky to start with, try not to add much extra flour as a wetter dough will make a better loaf. 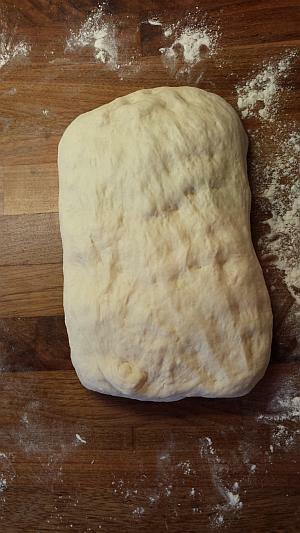 Knead until a smooth, stretchy dough is formed. 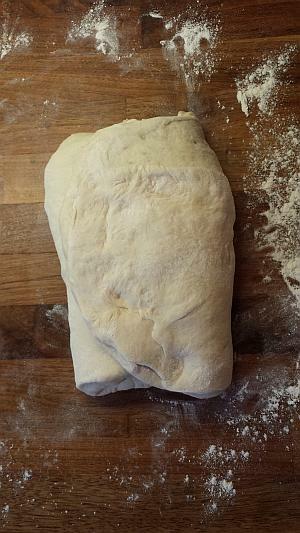 If kneading in a food mixer, use dough hook on low setting to start with, when a dough forms increase the speed to medium for a few minutes then return to slow for a few more minutes, until a smooth, stretchy dough is formed. Cover and leave to rise until double in size, timings will vary depending on the temperature, a few hours in a warm room, and longer if cool. 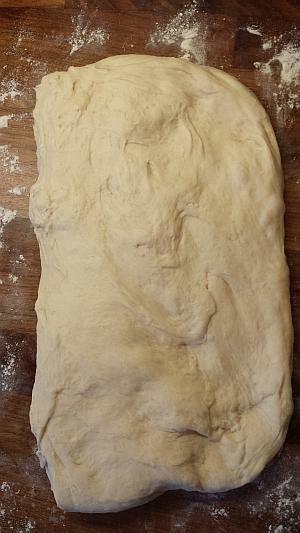 Turn the dough onto a floured surface and deflate and ease it into a rectangle shape by pushing it with your hands. 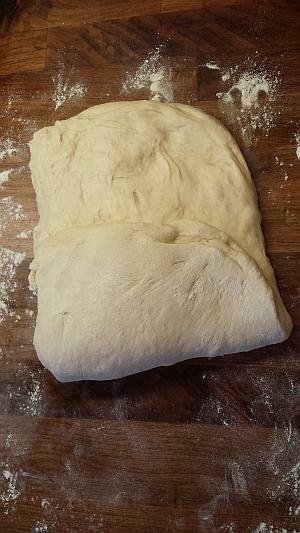 Fold the bottom third up over the dough, fold the top third down (like making puff pastry). Rotate 90 degrees and repeat twice. 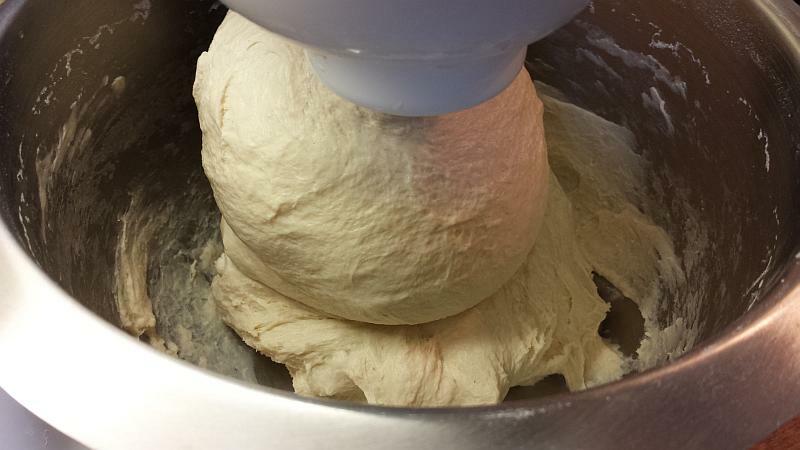 The dough should become smooth and springy. 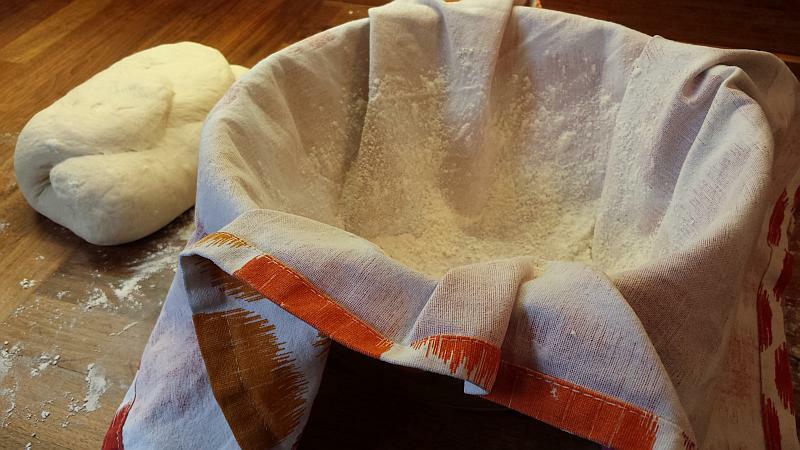 Create a proving basket by laying a tea towel in a large bowl. Dust with flour and place the dough smooth side down on the tea towel, dust the top of the dough with flour and cover with the overlapping tea towel. Leave to prove until doubled in size, probably around one and a half to three hours (depending on room temp, you can slow down/speed up to suit you by placing in fridge/warm place). Heat the oven to the highest setting, 250 c/Gas 10. 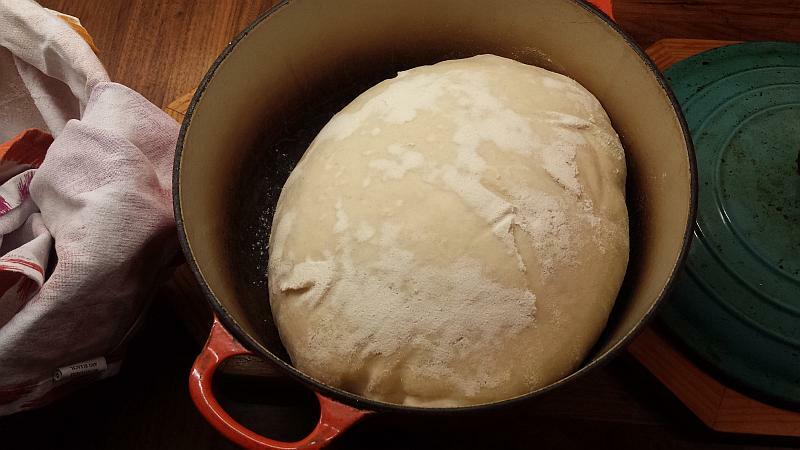 Place a large cast iron pan with lid in the oven, to warm up as the oven heats up (the pan will create similar conditions to a bread oven, giving the loaf extra lift and great crust. If you don’t have one just bake on a baking tray). When the oven is full temp, remove the pan and dust inside with flour, tip the dough straight in, place lid on pan and return to the oven. 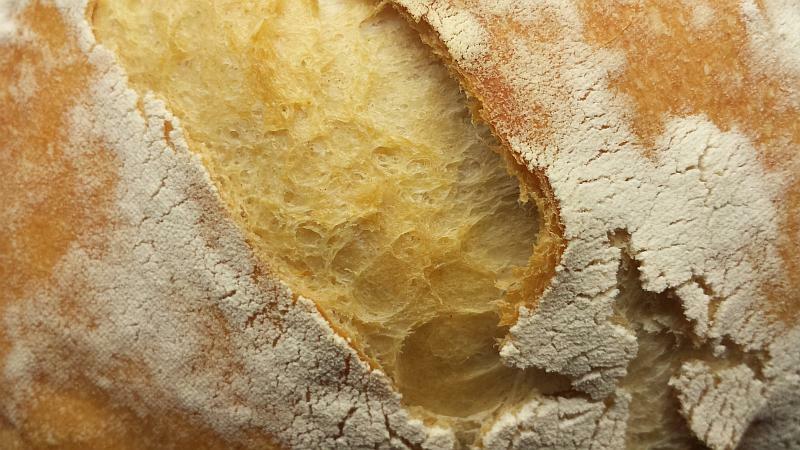 This entry was posted in baking, bread, cookery, Foodie, real bread, sourdough and tagged baking, bread, cooking, flour, food, pembrokeshire, sourdough, starter.